Transportation officials urge commuters to telecommute, shift their schedules, walk, bike, take the bus or the train, carpool or try the water taxi — anything but drive into work alone. 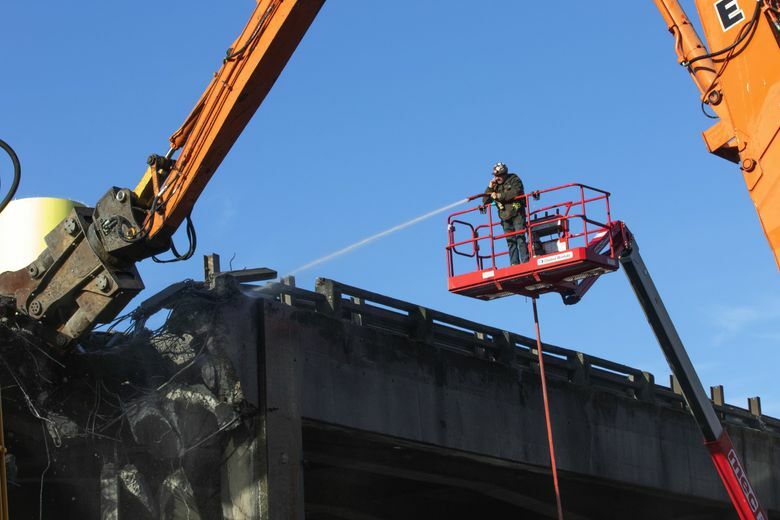 The preparation, the dress rehearsals, the warning and the pleading have come down to this: Viadoom, Seattle Squeeze, Goodbye-aduct — whatever you want to call it, Seattle’s new traffic imbroglio begins Monday, with the longest highway shutdown the region has ever seen. Monday morning marks the first weekday commute of the three-week closure of Highway 99, as construction crews race to build ramps and connect the new Highway 99 tunnel’s north and south ends to the existing roadway. Transportation officials are urging commuters to telecommute, shift their schedules, walk, bike, take the bus or the train, carpool or try the water taxi — anything but drive into work alone. The viaduct, before it closed forever Friday evening, carried more than 120,000 people every weekday — about 90,000 vehicles and 30,000 bus passengers. All of them will have to find somewhere else to go. Buses coming from West Seattle, White Center and Burien will be shunted off the viaduct onto the Sodo Busway and downtown surface streets. Buses coming from the north will see Aurora Avenue shrink from three lanes to one just north of Denny Way, as construction crews take lane space to connect the highway to the tunnel opening. Marx predicted the average bus commute taking an additional 25 to 30 minutes. Police officers will be deployed to intersections throughout downtown and Sodo during morning and evening commutes, to direct traffic and keep bus lanes and intersections clear. Officers will not be overriding traffic lights, SDOT said, but will work to make sure cars don’t “block the box,” furthering gridlock. 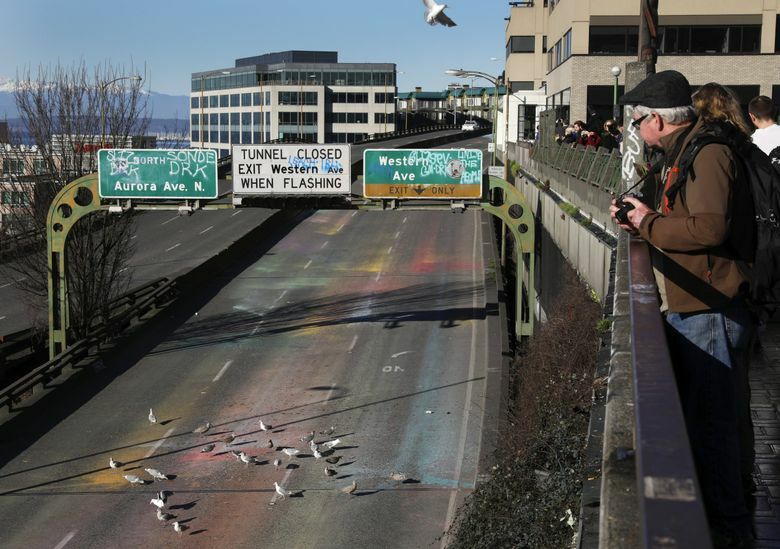 Preliminary plans call for about 34 uniformed police officers at 14 different intersections, from the West Seattle Bridge to Denny Way, between 6 and 10 a.m. and 3 and 7 p.m.
Officials hope the Highway 99 closure will last only three weeks — tunnel grand-opening events are planned for Feb. 2 and 3 — but bad weather could stretch the closure a little longer. 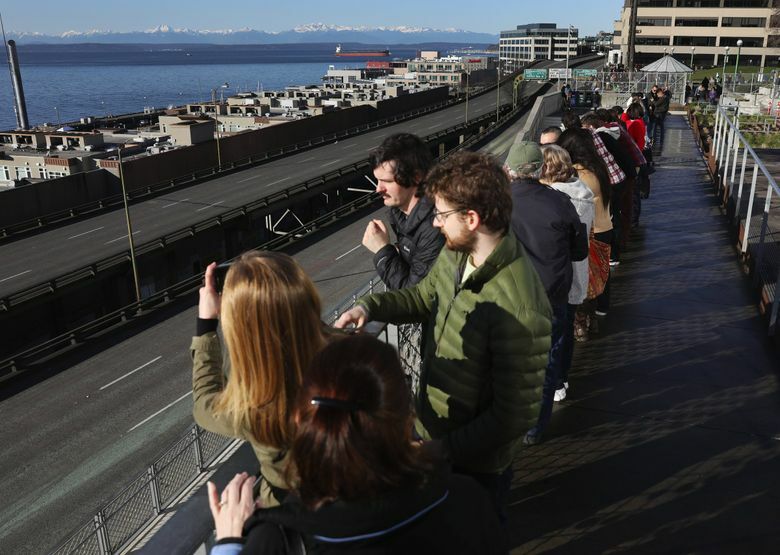 An impromptu celebration Friday night, complete with stalled cars, fireworks and honking horns, marked the end of the viaduct’s useful life. No more time for nostalgia — crews began turning the 66-year-old behemoth into concrete rubble Saturday morning. 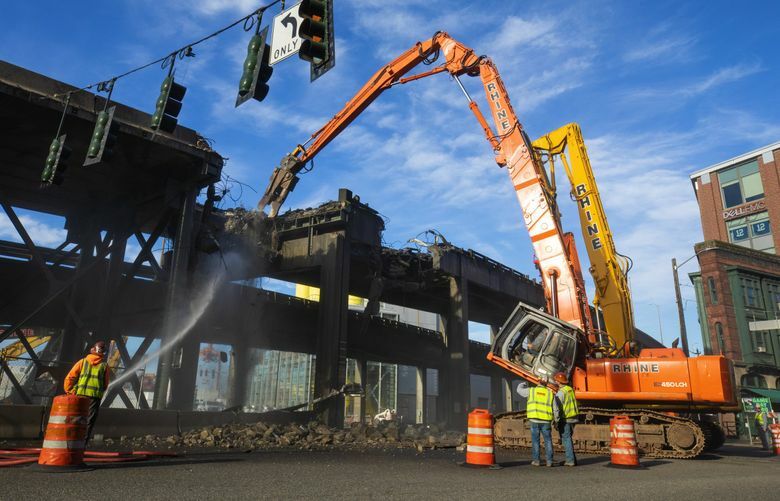 Using cranes armed with pneumatic hammers and giant steel crab claws, construction crews demolished a northbound onramp on First Avenue South. 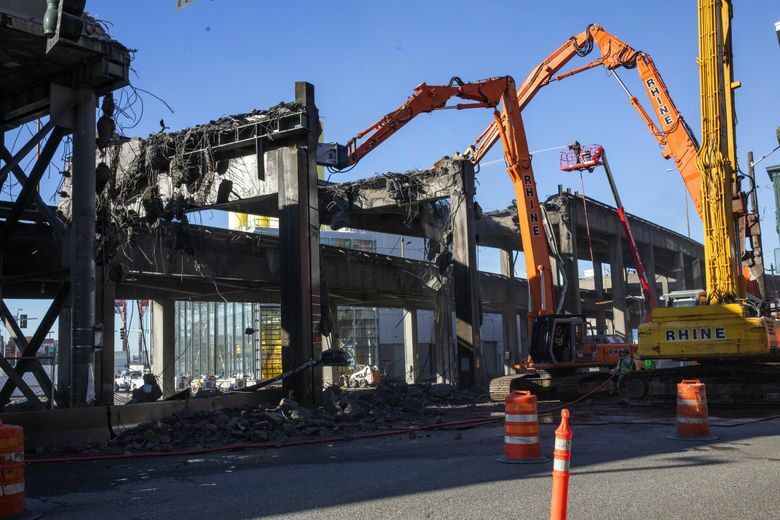 Most of the vast teardown will wait until February — following the opening of the Highway 99 tunnel — but the Sodo ramp had to go to make room for a new Dearborn Street intersection. Crews at the north and south ends of the tunnel also began working to remove embankments, where entrance and exit ramps soon will be installed. 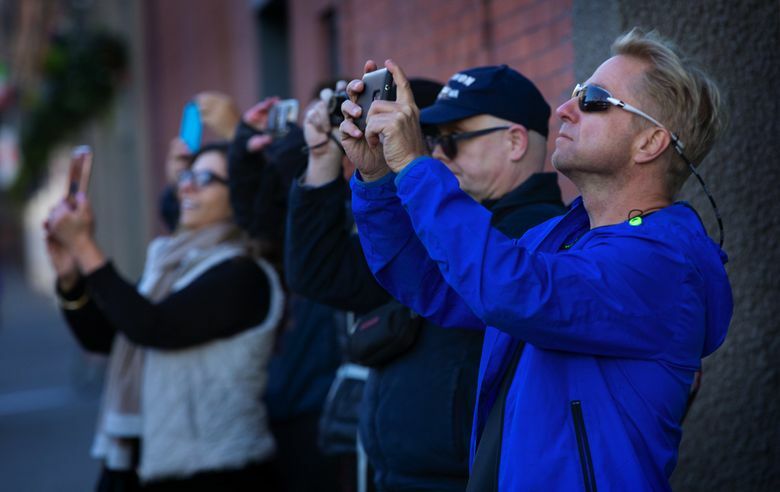 Dozens of pedestrians and bicyclists made their way onto the shuttered viaduct Saturday, strolling, pedaling and illicitly enjoying a roadway view previously available only to motor vehicles. By Sunday, officials were ready with added fencing and security, to keep people off the structure. The Columbia Street onramp featured an easy-to-evade chain-link fence, and a less-easy-to-evade security crew. Marx and Sowers spoke at a Sunday news conference on the waterfront, no more than 50 feet from the viaduct. Without two levels of traffic trundling by overhead, it was remarkably quiet. Viaduct traffic generated 80 decibels, similar to a kitchen garbage disposal, alongside Pike Place Market.